If You are running a business from home, you are privileged. Its not less than a luxury! You are free from the driving fatigue, rush hours traffic jam and much much more. Enjoying a homely comfort while working is a bliss. And you can top up this state of bliss with an excellent, original and organized home office decor! Following are the best possible home office decor ideas that can make your office life much better, easier and organized! The quick home office decor tips bring you the strategies which are easy to adopt, cost efficient and best suited for an original home office decor! 3. Outside the walled area of your home where you can install a home office pod or get your home office separately constructed. 4. Any room of your home that can have a separate entrance from the rest of house. Once you have allocated any specific room to be your future home office, the next step towards home office decor is an appropriate furnishing. Following is a set of home office decor tips about furnishing your home office. 1. Don’t over stuff the room with furniture. Use space efficient furniture that can have multiple usage. 2. Make sure that your home office decor is planned in such a way that it allows maximum space for work and storage. If you would clutter the room with heavy and bulky furniture, you would actually be sacrificing your work area. 3. There should be ample space for placing your computer and all relevant stuff, peripheral equipment, a corner for reference materials, storage racks or shelves for files and important documents and an appropriate location for placing frequently used reference supplies such as paper, folders and office stationery. 4. The most essential and inevitable furniture items for your home office decor would be a desk, an office chair, a book case, a few shelves, racks and drawers. 5. While selecting and placing your home office decorations and furniture, make sure that the arrangement is practical. there is good clearance left for each furniture item. Every part of office should be easily accessible. There should be an adequate sitting place. 6. Position your equipment and furniture according to the frequency of use. The gadgets that are of everyday use should be placed within the reach. The items that are rarely used should be placed on a hidden place. 7. When setting up hardware, be conscious of access to drives, trays and cords. Don’t block access to drawers or take up leg room with tangled cords. 1. Try to establish your home office decor lay out by establishing activity centers. The home offices zoned into activity areas are more organized and efficient to use. 2. In activity centers, there should be a work center first. which would include a clear work area. Containing a table, a chair, computer and the most frequently used items. 3. Then there should be a reference center, including all the reference materials such as files, manuals, dictionaries and professional books. It must contain not more than a book rack or shelf. 4. The last activity center should be the supply center, where you need to place the frequently used supply materials such as office stationery, papers and hardware accessories used for trouble shooting. You can impart your home office decor an interesting look and feel by using decorative items like wall hangings, innovative wall clocks, decorative shelves. 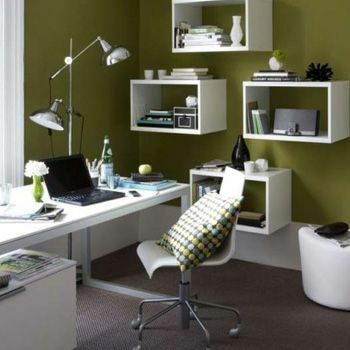 Also you can make your home office decor interesting by using unique and appealing wall paint colors. We hope you feel benefited after considering the above mentioned home office decor ideas.